Remember to comment as you go! 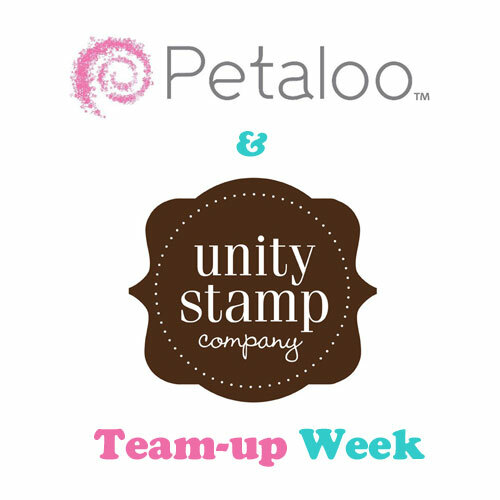 This month's focus at Petaloo is their Color Me Crazy Flowers. Georgia Peach ColorShine spritz by Heidi Swapp. behind it with one of my new folders by Brenda Walton. The "celebrate today" sentiment is also a part of the May KOTM. This particular Shabby Cut Canvas Flower came in two layers. onto a green mulberry paper flower (also from Petaloo) to act as the leaves. Enjoy hoppin', my Unity friends! What a wonderful wedding card. Love all the layers. Pretty card...love the big flower u chose! One of my favorite color combinations. Gorgeous flower. Beautiful focal point w/the flower. 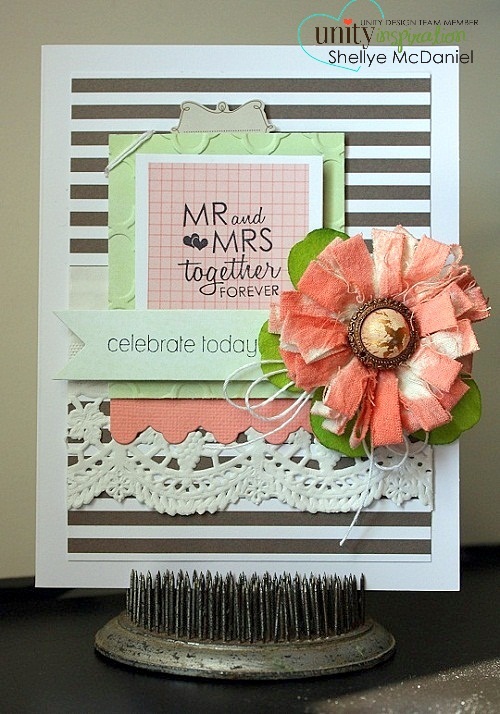 Pretty lace and flower together! Love the colors! What a beautiful card! 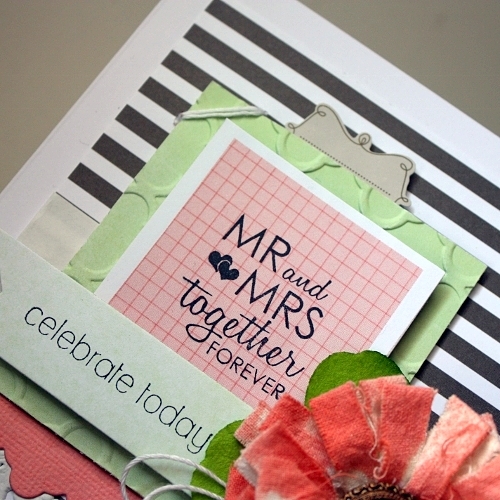 The layering & embossing look fantastic! what a sweet card for the couple. I'm sure they will love it as much as I do <3! What a great card! I love that striped paper and the embossed piece beneath the sentiment as well as the combination of sentiments. Just a great design! So pretty, loving the shaby chic flower!! Beautiful card. I love your layers. Gorgeous project, thanks for sharing your ideas with all of us! wow this is very pretty. I like the flower color. LOVE your card Shellye! How is it possible that you always create unique cards ... by now you've created so many! Don't you ever run out of ideas?? (I do! for cards that is .. ). So perfect for a wedding!!! Love the layout and colors!!!! Ohhh lovely card!! like the flower !! Very pretty! !Love the colors in the flower! Love how you tuned up the flower! Love the card & the great raggy coloured flower. Shellye, what a BEAUTIFUL card! I love the papers & the pretty colors. Very pretty card. The coloring of the flower is so nice. thanks for sharing. Wonderful card! Love all the layers and textures! Beautiful flower! TFS God bless!! Beautiful card. Thanks for the inspiration. Such a gorgeous card! Love the huge blossom! Love the colors and how they match the flower you died. Really like the color choices you made with your card. The diecuts add the perfect amount of elegance to your card. 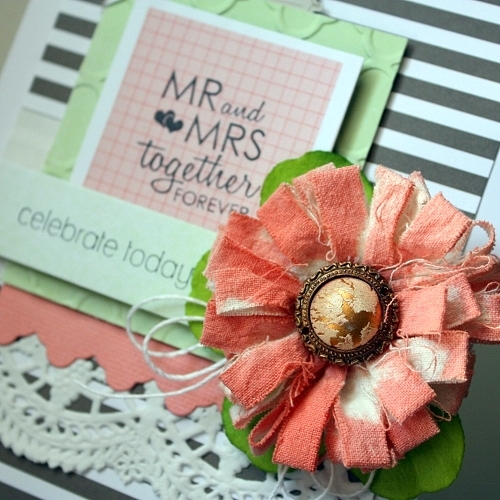 A beautiful card and wow, that distressed flower is so wonderful! Nice texture! Fabulous card! Love the flower! Great effect with that canvas flower! Love the layering! I hope my comment posted, but if not. I love the layering on your canvas flower! Love it! My fav so far! Gorgeous! Love the sentiment you chose for this lovely card.